Genus refers to a logical grouping of genotypes which may optionally be botanically related. Once entered the Genus Name text may be altered if required. Genotype records may either be entered manually or imported from file (see: Import Genotype). Synonym for genotype can be variety and should be used as a generic category. Genotype Name The name of the Genotype. Genus Select the Genus name. Genotype Colour Can be used for Plant Variety Rights Information. Species Name Latin name - common naming conventions should be established. Genotype Acronym Abbreviated name of genotype. 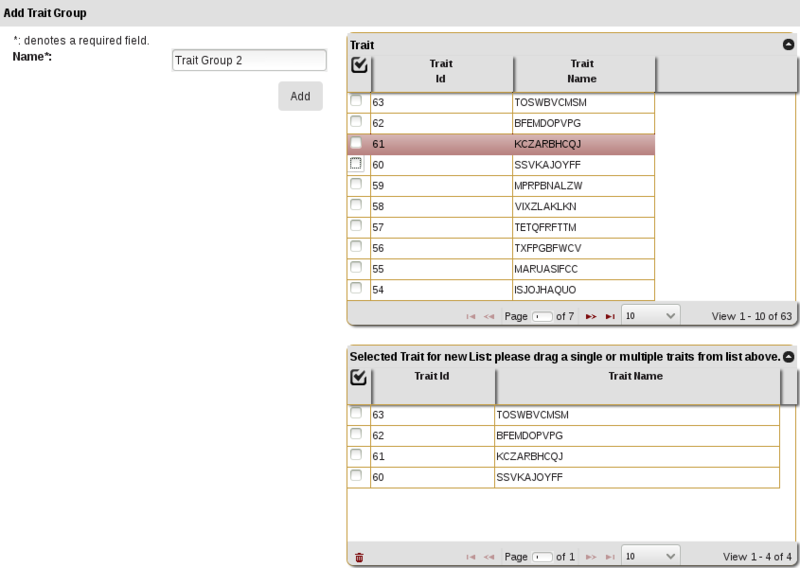 OriginId Source Identifier - possible Part of Plant Variety Rights Information - could refer to organisation or contact. Can be Published Indicate if Genotype is publicly available. Note Any notes regarding the Genotype. Access Fields Access Settings and Permissions. 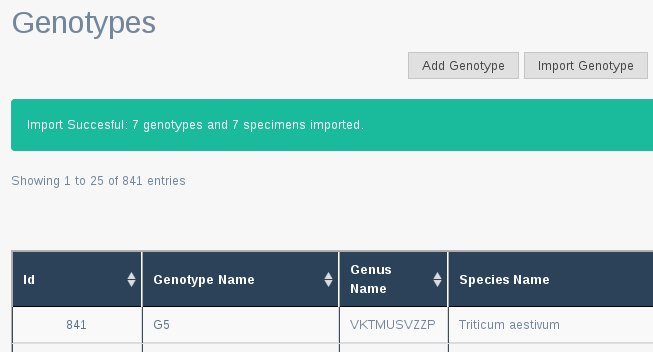 New Genotype records may be imported into KDDart and if required Specimens for the Genotype records can be automatically created within the process. The following illustration and table describes the fields required in an input file to import Genotypes and create Specimens if required. Note: Dialog window will match column names once users select file for import. Number of Specimens A value must be selected from 0-9. The value specified here applies to all Genotype records being imported unless overridden by the “Number of Specimen Column”. See example below. Genotype File M Select the input file for the import. Genotype Name Column M Column number for Genotype Name. Species Name Column M Column number for the Species name. Genotype Acronym Column The Acronym column is optional. Genotype Note Column M Column number for notes regarding the Genotype. Number of Specimen Column The column number which contains the ‘Number of Specimens’ to be created for a individual record. See example below. Genpedigree start Column The column number which begins a Genotype Name and Genotype Pedigree Type pairings. Use Genotype Names and Type Names. Access Fields (Refer to the Access Settings and Permissions topic) do not appear on the Import Genotype window. Number of ‘Specimens greater than zero’ - The specified number of Specimen records will be created for each Genotype record imported unless overridden by the individual record. Zero < Value < 10 - This number (value) of Specimens will be created for the Genotype. The following illustration shows the completed import fields for this file. 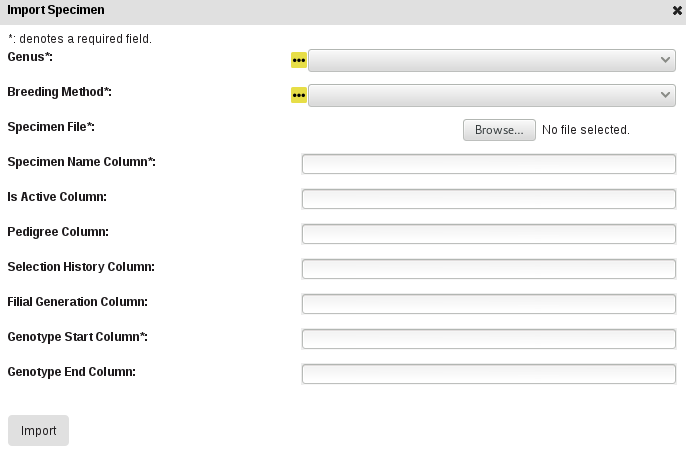 The import file shown above will create six Genotype records and four Specimen records when imported using the following KDManage form settings. Note: Those records in the file with a zero in the Specimen Number column will not have a specimen record created. Multiple Specimens are created for a Genotype, the Specimen name is given the Genotype name with a numeric suffix (eg for a Genus name ‘GenoA’, Specimen Names would be GenoA__1, GenoA__2, etc). Tip: Parents listed in CSV can either be Genotypes that are in the CSV or exisiting Genotypes that have already been added or imported. This will result in the following Genpedigree being created for Genotype “Ge3”. Genpedigree File M Select the input file for the import. Genotypes may also have a Genotype Alias added to help with identifying. 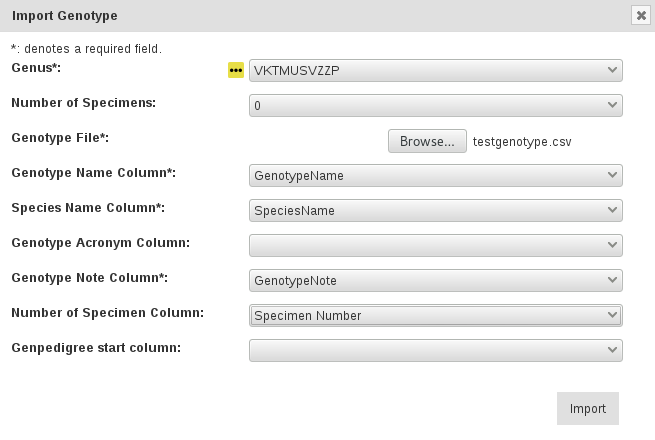 To add an alias to a genotype, click on the Add button . The Genotype page is an improved interface when viewing Genotype data. 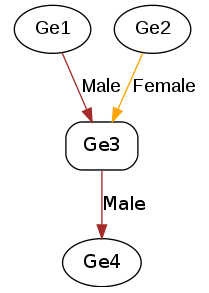 This can display the following entities related to the Genotype being viewed. Specimen is the physical representation of a genotype and this facilitates the recording of vital characteristics such as where and when it was grown. Interestingly for example, in horticulture one specimen may be composed of two genotypes (rootstock and scion). The KDDart environment anticipates these scenarios and caters for this requirement. Breeding Method M Select an existing breeding method for all the specimens in the input file. Specimen File M Browse to locate the input Specimen CSV file. Specimen Name Column M The specimen name column in the input file, numbered from zero. Is Active Column An indicator to show if the specimen is still ‘active’ (ie in production). 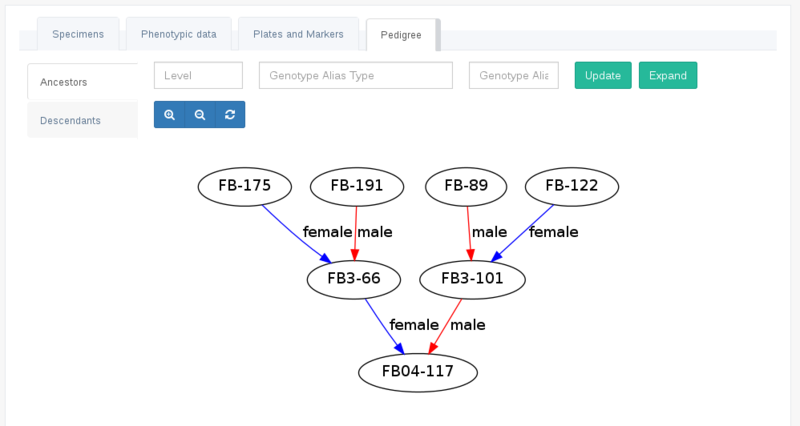 Pedigree Column Could be a generated Purdy string from male and female parent ID (or some other than Purdy standard). Selection History Column Optionally siblings clones etc, where genotype name is the same. Filial Generation Column Level of specimens being ‘selfed’, required when full selection history is unavailable. Genotype Start Column M The genotype name column in the input file, numbered from zero. Genotype End Column The second genotype name column in the input file, numbered from zero. Pedigree File M Select the input file for the import. Specimens can be added to Specimens Lists. 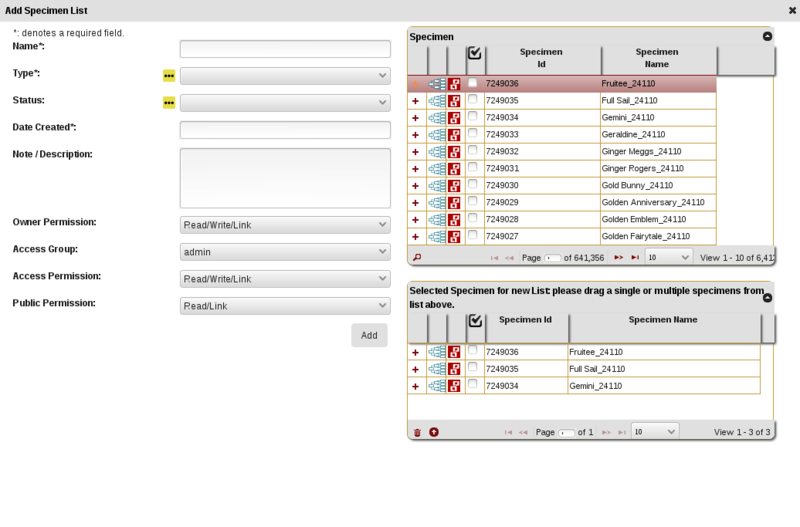 This allows specimens to be added in lists for convenience. Traits are important descriptors of what is to be measured and what the permissible values are in those measurements. The Trait/Measurement window enables the definition and quantification of a trait or characteristic of the trial/experiment. This includes a description and notes, the datatype, units of measurement, maximum value and validation rule. Note: Traits need to be defined before they can be assigned to a Trial. Once Traits are added here they will appear in the selection list for Add Traits to a Trial. Trait/Measurement Name M The name to identify the trait or measurement. Caption M An abbreviated or shortened trait name (e.g. name without spaces). Could be used for display. Description/Note M A description or note about the trait. Max Length M The maximum length of the value (e.g. 12). Unit M Unit of measurement for the trait (e.g. kg/h, colour, etc). Used for Analysis M May be used as an indicator (e.g export all traits need analysis). Type of Validation Rule _ Indicator for the type of validation rule (either a Boolean, Regular, Range or a Choice expression). Upon selecting a rule, a helper will appear that you can use to make sure you use the correct format. Validation Rule M A validation rule for the value of the trait. 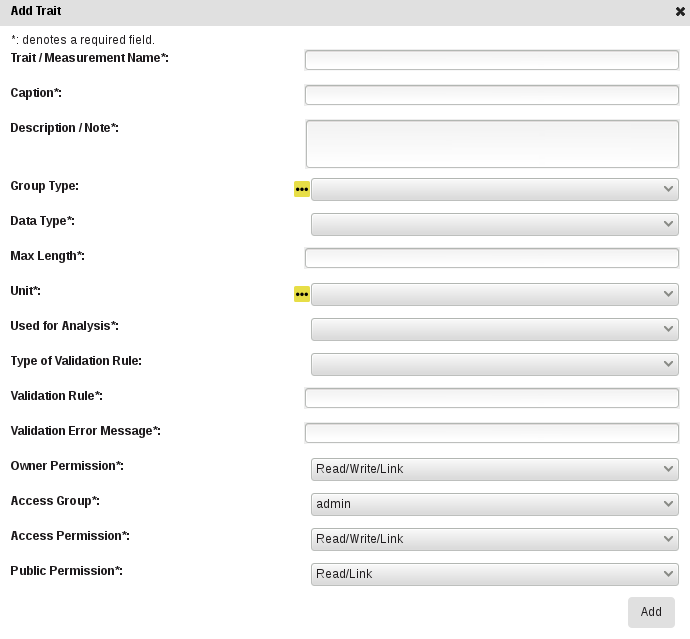 Validation Error Message M An error message to display, when the validation rule criteria is not met. 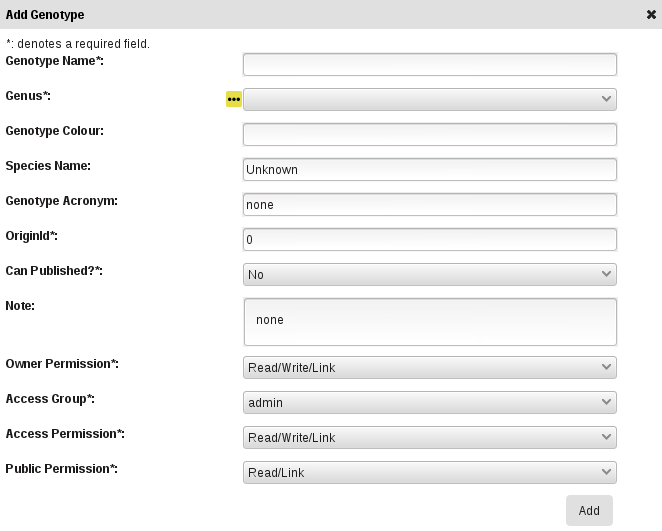 For Access Settings and Permissions fields refer to the Access Settings and Permissions topic. Traits can be added to Trait Groups. This allows traits to be added in groups for convenience. Treatment describes or quantifies an action performed on a trial unit in order to induce a measurable response, such as to a certain level of fertilisation (e.g. ‘Adding Nitrogen’) quantity of irrigation, etc.